The Trump White House surprised many back in March when its “skinny budget” proposed streamlining government by zeroing out funding for 19 small agencies that candidate Trump never mentioned during the 2016 presidential campaign. They included everything from perennial targets of the right, such as the National Endowment for the Arts and the Corporation for Public Broadcasting, to narrowly focused agencies unfamiliar to most in political debate, like the Denali Commission and the African Development Foundation. In theory, some agencies could still be targeted by Sept. 30, the deadline for Congress to act to fund the entire government. As usual, lawmakers will likely rely on a continuing resolution to do that. As of Aug. 8, the House had approved only a third of the 12 major spending bills (though all have emerged from the Appropriations Committee). The Senate, by contrast, has yet to take a single floor vote on fiscal 2018 spending bills, while its appropriations panel has disgorged only half the big bills. 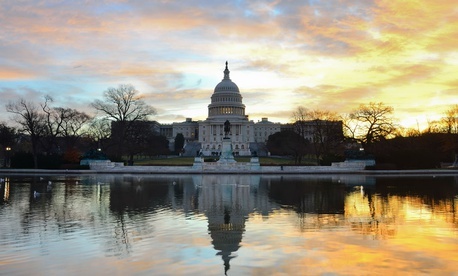 Reasons for the apparent reprieve for the 19 range from an Office of Management and Budget approach to its budget that did not stress consultation with Congress, to some pushback by the agencies working with their Capitol Hill patrons. In the case of the National Endowment for the Humanities, Chairman William Adams resigned in May after just three years in order to pursue a project defending the value of the humanities to society. In some cases, Trump may have changed his mind. In June, he buoyed the once-doomed, self-sustaining Overseas Private Investment Corp. by nominating a president and CEO (Ray Willets Washburne) and an executive vice president (David Bohigian). Both were confirmed by the Senate on Aug. 4. What follows is a Government Executive roundup of the relevant appropriations language, at varying stages in the budget process, for each of the 19 targeted agencies. The African Development Foundation, an independent agency that establishes targeted development programs in underserved parts of Africa, was earmarked by the House for $15 million for 2018 (in fiscal 2017 it requested $28.2 million). The Appalachian Regional Commission, an economic development agency created in 1965 to work in partnership with federal, state, and local governments, would receive $130 million under the House-passed Energy and Water spending bill, and $142 million under the Senate committee bill, a slight cut from its $152 million in fiscal 2017. The Chemical Safety Board, an independent reviewer of chemical industry regulations, would receive $11 million from the House, close to its budget request. The Senate has not weighed in. The Corporation for National and Community Service, which runs AmeriCorps/VISTA and other volunteer programs for improving fellow citizens’ lives, would receive just over $1 billion under the House-committee passed Labor-Health and Human Services, Education bill, the same as fiscal 2017 and nearly $900 million over its request. The Corporation for Public Broadcasting, which partially funds the Public Broadcasting Service and NPR, would under the House committee bill receive $445 million for fiscal 2020 (it receives two-year appropriations), which matches what it has earmarked for fiscal 2019. The Delta Regional Authority, a partnership that supports job creation and development in rural Mississippi and Alabama, under the House Energy and Water spending bill would receive $15 million for fiscal 2018; a Senate committee report in July recommended $25 million. The Denali Commission, created in 1998 to provide critical utilities, infrastructure and economic support throughout Alaska, would receive under the House Energy and Water bill $11 million for fiscal 2018, a cut of $4 million from 2017. A Senate committee recommended keeping it at $15 million. The Institute of Museum and Library Services would receive $231 million in 2018 under the House committee-passed Labor-HHS spending bill, the same as 2017 and $208 million above Trump’s request. The Inter-American Foundation, created in 1969 to give grants that channel development assistance in Latin America and the Caribbean, would get $11.25 million under the House committee-passed State, Foreign Operations spending bill. That’s about half of its budget for recent years. The new bill also contains authority for the foundation to receive a transfer of up to $10 million in development assistance funds to help implement U.S. strategy for engagement in Central America. The U.S. Trade and Development Agency, which helps companies create U.S. jobs through the export of goods and services for priority development projects in emerging economies, would receive $70.5 million for fiscal 2018 in the House committee-passed State, Foreign Operations spending bill. That’s a drop from its $75 million for fiscal 2017, but much higher than Trump’s proposed $12 million for phasing it out. The National Endowment for the Arts, whose budget traditionally aligns with that of the National Endowment for the Humanities, would get $145 million (as would the NEH) , under the House Interior, Environment appropriations subcommittee bill—a cut of $5 million each. The Neighborhood Reinvestment Corporation, an independent organization created in 1977 that provides rental assistance to low-income Americans, would receive $140 million under the House-passed appropriations bill. That’s level with its 2017 budget. The Northern Border Regional Commission, a federal-state partnership for economic and community development in northern Maine, New Hampshire, Vermont and New York, would receive $5 million in 2018, half of its 2017 appropriation, under the House-passed Energy and Water spending bill. The Senate panel report, however, recommends a raise to $15 million. The Overseas Private Investment Corporation, set up in 1971 to mobilize private capital to help solve critical development challenges, is authorized under the House State, Foreign Operations spending bill to spend up to $60 million for its noncredit account, with an additional $10 million for direct loans under the Foreign Assistance Act. It received $70 million for the noncredit account in 2017. The United States Institute of Peace, which works with nongovernmental parties in conflict zones, would receive $35.3 million under the House committee-passed State and Foreign Operations spending bill. It received $37.8 million in 2017. The Woodrow Wilson International Center for Scholars, which calls itself “the nation’s key nonpartisan policy forum for tackling global issues through independent research and policy dialogue,” would receive under the House-passed Interior, Environment spending bill $10 million, close to what it received in 2017. Correction: The Neighborhood Reinvestment Corporation is an independent entity, not part of HUD.